Chief Minister Yogi Adityanath government has taken several measures to curb cheating. 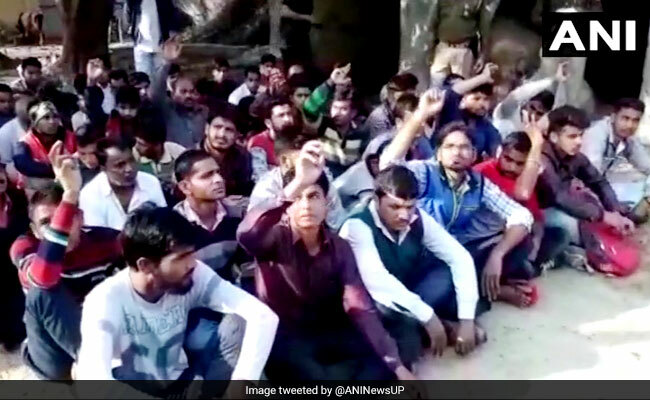 Aligarh: Over 60 people, who were busy answering the question papers on behalf of Class 12 students in Uttar Pradesh's Atroli area, were arrested yesterday. While students of Bhorey Kishan Lal Sharma Inter-College in Tebatu, around 30 kms from Aligarh, sat inside their examination rooms with their answer sheets, in a house on the opposite side of the campus, about 62 people, including three girls, wrote answers to the same question papers, police said. According to the arrangement to facilitate cheating, the police said, the answer sheets would be swapped at the end of the examination and and the ones written by these proxies would be sent for evaluation. The proxies got paid for their services. "We are questioning them and trying to figure out how much money was paid to these people. We managed to catch hold of Ram Kumar, the kingpin of the group," Senior Superintendent of Police R Pandey said. Ram Kumar brother Lakhan Sharma reportedly works in the state's education department. He allegedly helped swap the answer sheets. "We are trying to understand how these people got in touch with the students as well as those who wrote the answer sheets," the officer added. Mass cheating in Uttar Pradesh has been reported during board exams for years. This year, Chief Minister Yogi Adityanath government has taken several measures to ensure cheating-free examination. The state government has installed CCTV cameras and the special task force (STF) of the Uttar Pradesh Police is being used to help conduct free and fair exams. However, lakhs of examinees skipped the state board exams earlier thiss month in the wake of steps taken against the education mafia that aid in the use of unfair means. "When we said let's conduct a cheating-free exam, lakhs of students dropped out. I don't know what will happen in future," Mr Adityanath said.